Bright bows add a pop of color and a finishing touch to packages, wreaths, cards, and other types of craft projects. Sometimes a bow makes a present look so pretty that you don't even want to open it! Although stores sell premade bows, you can learn how to create professional-looking bows yourself. Don't worry—it's not hard at all. Just follow a few simple steps, and you will have a DIY bow that will rival anything you can find in a store. Beautiful bows are very quick and easy to make! 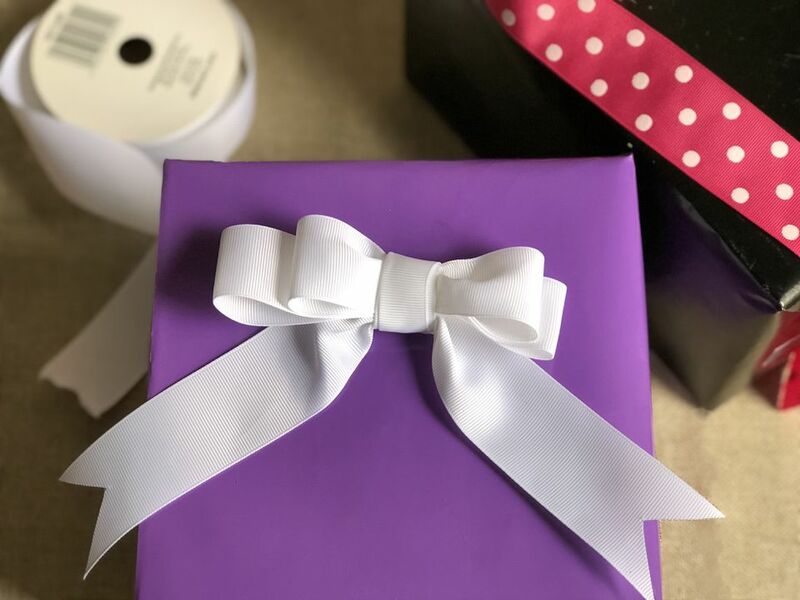 There are many types of bows, and the double loop bow is one of our favorites—simple but elegant .It works well on rectangular shaped boxes or as a finishing touch at the bottom of a wreath. Although this bow is crafted with ribbon, it's possible to create stunning bows from paper and even fabric. Just cut your fabric into long even strips and use in place of ribbon. The first thing you have to decide is how wide you want your bow to be. Cut a strip of ribbon that is twice as long as the width you want your bow to be plus a 1/2 inch. This ribbon will be the bottom loop of your double looped bow. Cut a second strip of ribbon that is about 1 inch shorter than the first ribbon. This ribbon will be the top loop of your double looped bow. Cut a third strip of ribbon that is about 1 inch longer than the ribbon piece that will be your bottom loop of the bow. That will be the tail of the bow. For example: If you wish to have a bow that is 4 inches wide, you will need one 8-1/2 strip for the bottom loop, one 7-1/2 inch strip for the top loop and one 9-1/2 inch strip for the tail. Glue the strips for the bottom and top loops of the bow into circles with a 1/2 inch overlap on each ribbon circle. Flatten each ribbon loop, and then place the shorter loop on top on the larger loop. Make sure the top ribbon loop is centered over the bottom ribbon loop. Pinch the ribbon in the center and then wrap a piece of floral wire around the center of the bow as in the photo above. Cut the floral wire tail with scissors so that only a bit remains, and then bend the wire backward under the ribbon bow. Pinch the center of the ribbon tail and wrap floral wire around tightly. Twist the floral wire to secure it. Cut the floral wire tail so that only about a 1/4 inch remains peeking out over the edge. Bend that piece of the floral wire backward under the center of the bow tail. Using your glue of choice, (we prefer hot glue), attach the top of the bow onto the tail and allow the glue to dry. Wrap the center of the bow with some ribbon to cover the back, then glue the end of that ribbon piece onto the back of the center of the bow. To give your ribbon symmetry, sometimes it helps to fold the ribbon for the center of the bow in half before you start wrapping it. Decide how long you want the tails of your bow to be and then cut the tail ends with scissors on a diagonal or into an upside down v shape to give them a finished look. Your bow is now ready to be placed on a package, wreath, or wherever you want to add a decorative finished look to your project.